This section provides a tutorial example showing margin-top of the second block is collapsed into margin-bottom of the first block. 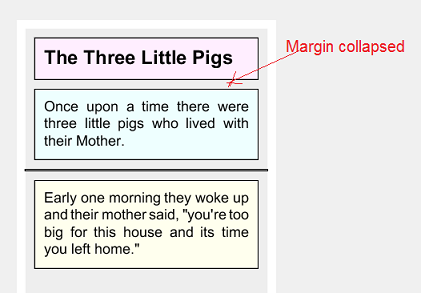 When designing "margin" attributes for "block" formatting objects we need to remember that when two block areas are stacked together in lr-tb writing mode, the "margin-top" for the second block will be collapsed into the "margin-bottom" of the first block. The total margin area will be the maximum of the two margins, not the sum of the two. - Copyright (c) 2016, HerongYang.com, All Rights Reserved. "you're too big for this house and its time you left home." The margin-top (0.1in) of the second block is collapsed into the margin-bottom (0.1in) of the first block. The total margin (gray area) is 0.1in, not 0.2in. The margin-top (0in) of the third block (the solid empty border line) is also collapsed to the margin-bottom (0.1in) second block. The total margin is 0.1in. What Are Block-Level Formatting Objects? What Is "block" Formatting Object? What Is "block-container" Formatting Object?